One of the most shameful legacies of the Vietnam War is the US military’s use of the deadly defoliant Agent Orange, dioxin. The military sprayed it unsparingly over much of Vietnam’s land. An estimated 3 million Vietnamese still suffer the effects of those deadly chemical defoliants. Tens of thousands of US soldiers were also affected. It has caused birth defects in hundreds of thousands of children, both in Vietnam and the United States. 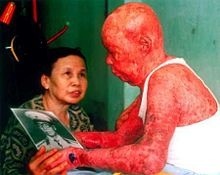 It is currently affecting the second and third generations of people directly exposed to Agent Orange decades ago. Certain cancers, diabetes, and spina bifida and other serious birth defects can be traced to Agent Orange exposure. In addition, the chemicals destroyed much of the natural environment of Vietnam; the soil in many “hot spots” near former US army bases remains contaminated. In the Paris Peace Accords signed in 1973, the Nixon administration pledged to contribute $3 billion toward healing the wounds of war and the post-war reconstruction of Vietnam. That promise remains unfulfilled. Despite the continuing damage and injury wrought by Agent Orange, the Pentagon website makes scant mention of “Operation Ranch Hand.” It says that from 1961 to 1971, the US sprayed 18 million gallons of chemicals over 20 percent of South Vietnam’s jungles and 36 percent of its mangrove forests. But the website does not cite the devastating effects of that spraying. Antiwar activists who signed the petition include Tom Hayden and Pentagon Papers whistleblower Daniel Ellsberg. “All of us remember that the Pentagon got us into this war in Vietnam with its version of the truth,” Hayden said in an interview with The New York Times. “If you conduct a war, you shouldn’t be in charge of narrating it,” he added. It is no cliché that those who ignore history are bound to repeat it. Unless we are provided an honest accounting of the disgraceful history of the US war on Vietnam, we will be ill equipped to protest the current and future wars conducted in our name.